Oh what fun! It’s the 100th SUO Challenge! Just how COOL is THAT!!! So since it is our 100th challenge we have a fun 100th theme. We got to pick ANY of the OTHER 99 challenge and do it again! So I decided to do SUO77 which was Happy Birthday! 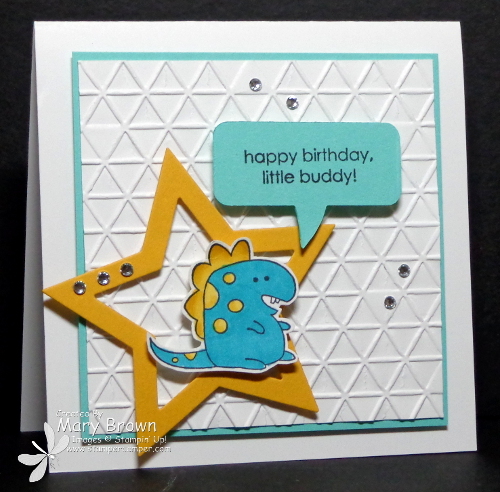 I just absolutely LOVE this fun little set – Little Buddy Birthday! Cut out a word bubble from Coastal Cabana cardstock. Since there wasn’t one the right size so I ran through a second time to make it smaller. Then I flipped it over and stamped on the other side and then add using dimensionals. Add some Basic Rhinestones to finish it off. This entry was posted in SUO Challenge and tagged Little Buddy Birthday. Bookmark the permalink.